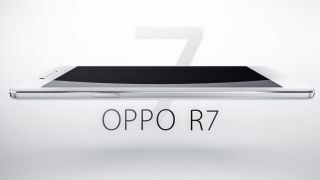 Oppo has announced two new additions to its smartphone family; the Oppo R7 and Oppo R7 Plus at a 10 year anniversary event being held in Beijing. The Oppo R7 features a brushed metal design and 5-inch 1080p display, whilst under the hood is 3GB of RAM with an octa-core Qualcomm Snapdragon 615 processor clocked at 1.5GHz. There's a 2320mAh battery pack alongside VOOC fast charging with Oppo saying it will offer two hours of call time after five minutes of charging and the phone will reach 75% battery after 30 minutes. As for the rear camera it has a 16MP sensor and now launches in 0.7s and boasts PDAF face detection, auto focusing in 0.1s as well as offering anti-shake optimisation and flash shot. There are also 5 new camera modes Super GIF, Selfie Flash, Double Exposure 2.0, Gorgeous Filter and Quick Motion. Oppo also announced an R7 Plus phablet the same brushed metal design, the same Qualcomm processor, 3GB of RAM, 32GB of storage and a 4,100mAh battery paired with VOOC fast charging. The phablet also comes with a 6-inch 1080p display with 2.5D curved technology, a fingerprint sensor on the front, 4G connectivity and a new laser auto-focus camera with an RGBW sensor for 32% brighter images. Oppo has also introduced ColorOS 2.1 including a brand new redesign for all Oppo apps and the 200 most popular apps used in China to fit in. Oppo admits its OS has had some troubles in the past and has worked on booting to improve it from 30 seconds to 19 seconds, the same range as Android 4.4 and TouchWiz 5.0, whilst app launching has also been improved and the system crash rate is much lower. The press conference finished with a quick mention of a Compass band wearable with a heart rate sensor inside without any other details whilst an Oppo produced Selfie Stick was also announced. There is no wording on pricing for the UK, US or Australia yet but the fact we've been invited to the launch event suggests it'll be coming to at least one of these markets – although it may be hard to find like the N5 was. Both are available in gold and silver in China from tomorrow, but it looks like western markets will have a little while to wait for the phones to launch. It's 10 years since Oppo started out first creating MP3 players that took China by storm before moving into feature phones in 2007 and smartphones from 2010. TechRadar is here covering all the latest at Oppo's big birthday bash so expect some hands-on reviews once we've had enough time to play around and give a proper first time verdict on them. Before then, read our review of the Oppo R5 here.